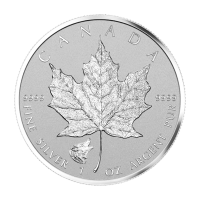 Get a piece of the action when you purchase 1/4 oz 2018 Royal Canadian Mint Maple Leaf Flex Multibar Silver Coin Pieces. 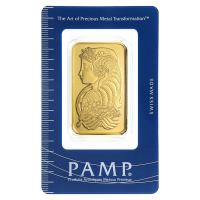 The 2 oz 2018 Royal Canadian Mint Maple Leaf Flex Multibar silver coin is taking the market by storm, so get your affordable piece of the action when you purchase this intricately designed 1/4 oz piece broken off from one of the 2 oz bars! 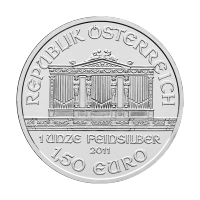 The Obverse proudly boars Elizabeth II along with a 1 dollar value stamped on the bottom framed by scroll work carvings in each corner. 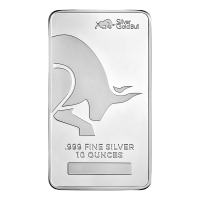 The reverse of the bar proudly displays a pair of Canada's national symbol; the maple leaf, following by the year of issue 1/4 oz weight, and 9999 ag purity stamp. Anverso Retrato de la reina Elizabeth II con diseños de pergaminos escondidos en cada esquina. Reverso Dos hojas de arce extendiéndose desde una toma, con el año, 1/4 oz de peso y pureza grabados en la barra individual. Retrato de la reina Elizabeth II con diseños de pergaminos escondidos en cada esquina. Dos hojas de arce extendiéndose desde una toma, con el año, 1/4 oz de peso y pureza grabados en la barra individual. 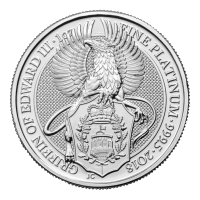 Pieza de Moneda de Plata Multibarra Flex Hoja de Arce Canadiense 2018 de 1/4 oz de la Casa de la Moneda Real Canadiense Get a piece of the action when you purchase 1/4 oz 2018 Royal Canadian Mint Maple Leaf Flex Multibar Silver Coin Pieces. 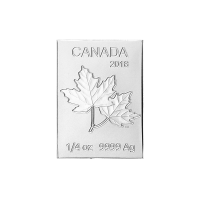 The 2 oz 2018 Royal Canadian Mint Maple Leaf Flex Multibar silver coin is taking the market by storm, so get your affordable piece of the action when you purchase this intricately designed 1/4 oz piece broken off from one of the 2 oz bars! The Obverse proudly boars Elizabeth II along with a 1 dollar value stamped on the bottom framed by scroll work carvings in each corner. 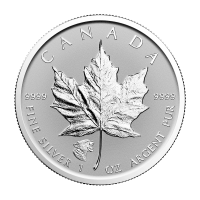 The reverse of the bar proudly displays a pair of Canada's national symbol; the maple leaf, following by the year of issue 1/4 oz weight, and 9999 ag purity stamp. Get yours before they all sellout!